Hi Peter good to see you again, thanks for agreeing to do our June instalment of 60 second interviews, can you give us a brief overview of what SwRI does? Southwest Research Institute, headquartered in San Antonio, Texas, is one of the oldest and largest independent, nonprofit, applied research and development organizations in the United States. SwRI’s nine technical divisions provide contract research and development services in technologies that span deep sea to deep space to industry and government clients. Why do you include tribology research in your portfolio? Friction, wear and lubrication are part of everyday life and affect everything we do and touch. We offer full and comprehensive solutions to help our clients resolve their most challenging problems. To do that, it is necessary that our highly qualified staff have high-quality, well-equipped tribology laboratories. What tribology research are you performing at the moment? We are currently undertaking a wide spectrum of research including developing new rigs to study and quantify low levels of fuel lubricity additives, sampling oil from behind the piston ring of diesel engines to better understand the effect of oil formulations on scuffing, helping improve cutting fluid/material compatibility for computer numerical control (CNC) machining, and selecting bushing material for hydroelectric dam gates. Your work is roughly 50% for the automotive industry, have you seen a shift in the testing requirements over the years, if so how? Most of the technology that has had the greatest impact on fuel economy already have been incorporated, including the most recent implementation of a reduction in viscosity of engine and some drivetrain lubricants. As such, testing has become more detailed, comprehensive, and expensive. We also have seen increased instrumentation of full engines, real-time wear analysis using radioactive tracers, and benchtop replication of sub systems. Another significant trend in recent years, driven by the increasing cost and number of engine tests required to qualify an engine lubricant, is an increased demand for screener tests for the sequence engine tests. How does tribology research aid the automotive industry? As it becomes increasingly more difficult to find fuel economy savings needed from vehicles, tribology research is one of three main routes to achieving this. (The other two being combustion strategies and weight saving.) Being able to separate individual engine and drivetrain components and characterize their friction and wear in response to geometric, material, coating, finishes and lubricant changes, allows the development and selection of new combinations that result in, for example, superlubricity (0.04 CoF) for ring and liner combinations. In your opinion, what effect will electric cars have on the automotive industry and when do you see this taking effect? We are already seeing the effect of electric vehicles on the automotive industry. The myriad of possible engine/electric motor combinations in both engines and drivetrains is creating some lubrication confusion. The addition of stop-start using 48v motors will remove some of the durability concerns of traditional engine stop/start. However, adding electric motors within the drivetrain raises lubricant concerns over cooling, copper corrosion of windings, high-speed bearings and electrical conductivity. Between 5 percent and 35 percent of new vehicles sold in 2025 are predicted to be all-electric, depending on the source. This number will fluctuate from country to country depending upon legislation and financial incentives. However, I do not believe the internal combustion engine is going away any time soon – hybrids will become commonplace, but the energy density of liquid fuel will be challenging to beat and this, combined with required infrastructure and supply capacity, will keep full electric vehicles in the minority for decades. Why do you use PCS Instruments for this research? We use the best tribometer for the research we are performing. The laboratories at SwRI have many different rigs, both manufactured in-house and purchased from a number of manufacturers, including PCS. What modifications/advances would you like to see in tribology equipment to aid your research? We see an increasing need to measure smaller and smaller differences in friction between parts in our test rigs. We spend a great deal of time improving the rigs, specimens and specimen holders in our laboratories to reduce the noise in the measurement in order to have confidence in the measured differences and to ensure the measured differences are larger than the measurement noise. Where do you see the future of Tribology Testing – do you see modelling and simulation overtaking physical testing? I sincerely hope not as I have never enjoyed maths! However, we have seen an increase in modelling and simulation over the past 3 to 5 years. 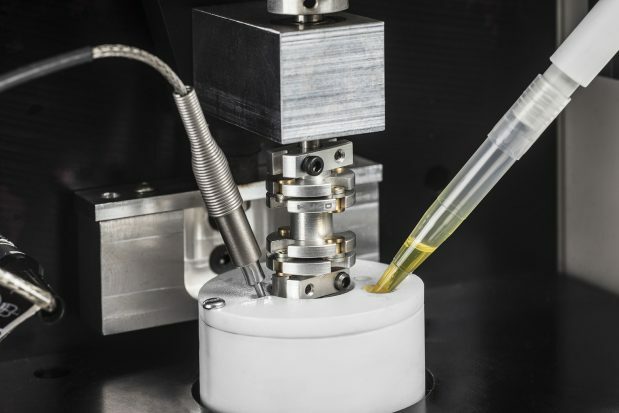 Fortunately, this has not reduced the need for tribology testing since we have clients who require experimental verification of these models as they develop them. Perhaps one day, all experimental work will be replaced by modelling, but I doubt it and will hopefully have retired if that does occur.